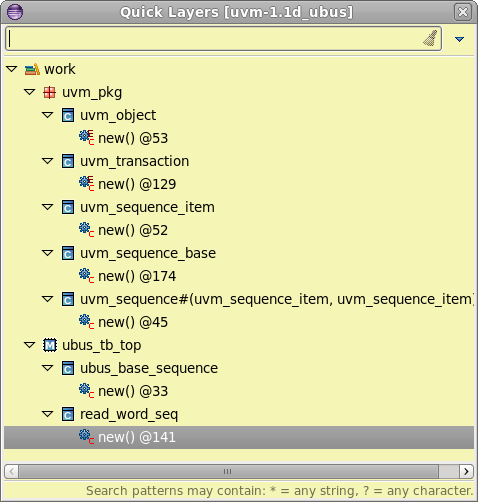 For an extern declaration you can quickly see where it is implemented using the Layers View. Position the cursor on the element's name and press Shift+F3 or right click and choose Show > Layers from the menu. The Layers View is automatically raised at any invocation. You can also open it from Window > Show View > Other... > DVT > Layers. Double click on a layer and jump to the corresponding source location. Right click on a layer to see its Usages. Position the cursor on the element's name and press Ctrl+Shift+O. The Quick Layers View will pop-up and present a filterable list with all of the selected element's layers. Select a layer and press Enter or click to jump to the corresponding source location.